We are in the north-east part of the island, next to the first traditional and scheduled settlement of Oia that is under the protection of UNESCO. ''Anemos''is a part of a complex of four cute houses/apartements, called '' Sun Anemos''. ''Anemos''is an extremely comfortable suite of 60sq. with independent entrance and a big private veranda of 20 sq. m. with pergola. It can accomodate 6 people. In the living room, there are two traditional built-in sofas that can accommodate two more persons. With its excellent arrangement, which complies with the Cycladean architecture, ''Anemos'' manage to combine a warm family atmosphere with ultimate privacy.
.''Anemos''is a part of a complex of four cute houses/apartements, called '' Sun Anemos''. Our domain is so close to the main village,about 3,5 km and also far enough of the busy,noisy and crowdy Oia. Here you can let yourself in nature’s magic hands. The endless view and the open view of the Aegean Sea and the nearby islands,you can really relax,swim in the sea in front of us and enjoy your vacation. ''Anemos''is an extremely comfortable suite of 60sq. with independent entrance and a big private veranda of 20 sq. m. with pergola. It can accomodate 6 people. With its excellent arrangement, which complies with the Cycladean architecture, ''Anemos'' manage to combine a warm family atmosphere with ultimate privacy. A small, picturesque path of 50-60 meters about through vineyards, leads to the beach of Oia. Free toiletries. Bathrobes and slippers are also provided for your comfort. All linens (bed sheets, pillows and pillow cases) are provided. We offer a daily service-cleaning and every second day,we change sheets and towels. We can also dry your laundry for you. All towels( for bath, kitchen and beach) are provided. We offer a daily service-cleaning and every second day,we change sheets and towels. Every day, we offer free of charge, the capsules for the coffee machine. A basket of various baked goods, coffee capsules and tea is offered daily to the guests. A complimentary bottle of mineral water is provided upon arrival. Here you can let yourself in nature’s magic hands. The endless view and the open view of the Aegean Sea and the nearby islands. From the moment my family and I arrived at Sun Anemos, we knew we'd be in good hands. Elsa and Yiannis treated us like family, from delivering fresh pastries to our room each morning, to giving helpful recommendations and constantly making sure we were well cared for. While our suite was a little tight for six people, it was perfectly clean, comfortable and charming. The property is peacefully situated away from the hustle and bustle of Oia & Fira, and just a few steps from the beach. 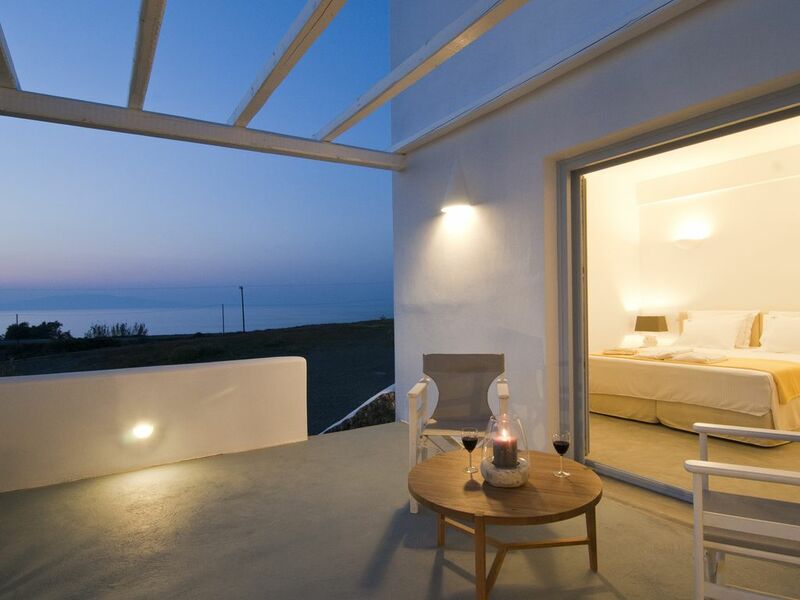 I would recommend Sun Anemos to anyone looking for an unforgettable stay in Santorini. Thank you Elsa & Yiannis, we miss you! Marissa with her sisters and brothers visited our property for 3 days.They were an amazing company that they took care of our house. We are very happy that we met them. We wish you all the best for your life and we hope meet each other again in future..!!! Thank you for your choice to stay in our property and for your great reviews..!!! We loved our beautiful apartment and veranda overlooking the sea! Amazing!!! From the moment we arrived everything was perfect. Our hosts were always available to offer suggestions. Our accommodations were very clean and comfortable. The beds were superb. We enjoyed sitting outside at night and eating breakfast in the morning on our private veranda. The location was quiet and peaceful and beach access was just a few steps from the house. From the moment you arrive on the island until the time of your departure,we will discreetly close to you for any assistance you will need. We wish our guests feel like home and they will behave at the rental property as if the suite was their home. Only guests listed on the reservation contract may use the property.The number of the guests may not exceed the maximum number indicated in the reservation contract. The rates are for 2 people.Every extra person will be charged 25 euros per night. We expect from our guests to respect and take a very good care of the house.